“We have made tremendous advances for integrative medicine and health over the last ten years. Now we are poised for much more.” These were among the first thoughts from Frederick (Rick) Hecht, MD in a brief interview upon learning he was elected to chair the Academic Consortium for Integrative Medicine and Health (“the Consortium”). The full professor at the University of California School of Medicine established himself as an AIDS researcher and presently holds an endowed chair in integrative medicine – a rarified academic position for the still upstart academic integrative medicine community. Respect for Hecht is international. He is on the board of ISCMR, a global organization representing researchers in traditional, complementary, alternative and integrative medicine and health. He was drafted — due to health issues of a colleague — into the chair role at the Consortium. The Consortium, with its 70-plus member academic health centers and medical delivery organizations is, on paper, potentially the most powerful engine for change in the field. Hecht quickly ticked off his agenda. He spoke to both internal and external dimensions. Hecht referenced a May 6 meeting of Consortium members prior to the recent conference in which Consortium members chose to engage a robust self-examination to strengthen the organization’s capacity for service, transparency, and resilience: “We will be looking at what’s going well and what needs work,” said Hecht. He noted that the exploration could go so far as considering potential bylaws changes. Over the past four years, the charismatic Parker has held leadership positions in each of the Academy’s most significant initiatives: the 5-day annual conference that draws over 1000 attendees and the Academy’s Fellowship in Integrative Health and Medicine. That pioneering interprofessional fellowships has quickly grown to have enrolled 150 fellows to date. Parker first became known in the integrative community for her pioneering work in global medicine. She co-founded and was executive director of Natural Doctors International (NDI), the first international service-learning program that provided primary integrative services in an underserved community. Utne Reader honored Parker as a visionary for that work in 2011. She subsequently established a formal collaboration between NDI and the Pan American Health Organization (PAHO) to support the WHO Traditional Medicine Strategy 2014–2023 while also helping guide her profession into organizing for a relationship with WHO, serving a period as co-secretary general of the World Naturopathic Federation. Parker’s educational roles, beyond those at AIHM, include service as founding co-chair of the Master of Science in Global Health at National University of Natural Medicine, and as faculty at Bastyr University. 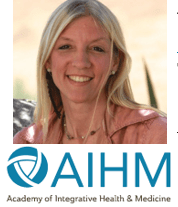 Her global perspective shapes her view for AIHM’s future: “Collectively we are stronger and smarter. Diversity also brings Innovation. Our focus and commitment to our interprofessional community and patient access to all medicines and professionals – integrative nurses and medical doctors, chiropractors, naturopathic doctors, acupuncturists, traditional medicine healers, the list goes on and on – is essential to realize the dream of holistic healthcare for all on this planet.” Parker replaces Tracy Petrillo in the position. The announcement came in an update letter from AIHM chair Bradly Jacobs, MD, MPH and the rest of the organization’s interprofessional Board of Directors. Notably – give Consortium chair Hecht’s UCSF base, the Fellowship has announced a new “clinical academic affiliation” for 2019 with UCSF. It’s an institution where Jacobs served as the first clinical director. These worlds are already nicely intertwined. Here’s to the collaboration in policy change that might grow out of this fertile ground.